Jesus4UsAll launches some great new features to help members and visitors. Live Chat - To help with prayer ministry and with general enquiries. 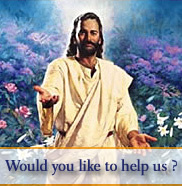 Forum - Jesus4UsAll Forums, for Prayer ministry and Christian Topics of all kinds. If you have any items of news that you would like us to post here, please let us know. Did you know Spiro, founder of Jesus4UsAll had a talent for Painting Statues? Well, Spiro has just made known that he painted a 50 year old statue of St Pope Pius X, for St David's Metropolitan Cathedral, Cardiff. Pope Pius Statue gets renovated by the founder of Jesus4UsAll. Thanks to some clever software, you can now have access to the Full Catechism of the Catholic Church. It has many useful features, such as, Full Screen Zoom, Print page and a search facility to look up the topic your want to research or read. Why not take a look now and see what you think of it. Catechism of the Catholic Church or click the heading here to go directly there. Hope you like this New feature, let us know what you think. Jesus4UsAll is happy to announce the launch of it's first Card. The St David Greeting card. Although it's design is for all year use, it is particularly of great interest for the Welsh home and abroad, who would like to send their friends and family greetings. It is also of great interest for Welsh communities living abroad, and for those who celebrate the saints feast day, St David's day, celebrated on the 1st March. Take a look at this unique card now and make sure to order well before St David's Day. We would like to wish you and your family a very blessed New Year. May the Good Lord move in your life in a new way. Jesus4UsAll introduces new discounts on all its books. You can now recieve upto 40% off on all books when you purchase in quantity. Now you can purchase all the books in multiples and save money by purchasing them at a discount price. Books like the Rosary of Liberation and Prayers of Power books I, II and III as well as many others can enrich your life and those of your family, prayer group and community. Jesus4UsAll to distribute New Book, "The Road to Pentecost Book", published jointly by the CTS and the Good News Magazine. We are happy to announce that we are introducing the launch of a new book, " The Road to Pentecost"
We are currently looking for distributors, Parishes, Prayers Groups, and Communites to sell this book online. Retailing at £1.95 this book is designed to take people through from Easter to Pentecost, through daily prayer, concluding with a Novena to the Holy Spirit. A pricing structure has made it possible for you to get a greater discount the more you purchase. This means for communities or churches they can purchase for as little as £1.25 GBP when purchasing 100 booklets or more. Limited quantities have been printed so we invite those interested in purchasing or distributing this book in their area to place their orders quickly.